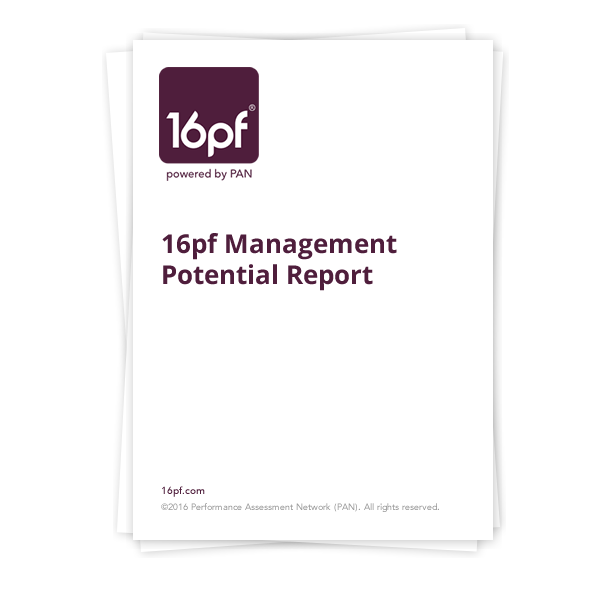 The 16pf Management Potential Report (MPR) assesses management potential and competency strengths by analyzing the personality dimensions associated with success in a broad range of managerial settings, and projecting how the examinee might be expected to function. The report provides insights into the examinee’s personality, describes personal strengths, and identifies areas for potential growth and development. From early-career to the executive suite, the 16pf MPR facilitates succession planning with brief narrative and scores on the personality characteristics associated with managerial performance. The behavior likely to be used with subordinates: controlling others, participating with them, or giving them extensive freedom. The personality traits contributing to the individual’s particular style are also described, concluding with a statement of the person’s overall potential for leadership. Key factors in determining how well the person can work with people, e.g., comfort level when speaking to groups, personal style, and general social skills. How the person would approach situations that call for reasoning and decision-making. Capacity to assume responsibilities inherent to managerial positions, the need to supervise and the need for supervision. Tension, reaction to stress, and self-control – the three personal adjustment traits that impact managerial performance and influence a person’s life both inside and outside of the workplace. The report’s narrative feedback section can be shared with the examinee as a first step in the development process – increasing the individual’s awareness of his/her personal strengths and challenges. Then, when in-depth development is warranted, an additional 16pf report can be generated from the same test administration to help the individual to fully utilize his/her personal assets and develop areas that are not up to par. Applications for the 16pf MPR include succession planning, management selection and placement, individual development, career and outplacement counseling. This report is available for purchase on the PAN platform, along with many other assessments and features!